The property is situated in the extremely sought after Warren area of Crowborough within walking distance of the town centre and within easy reach of junior and senior schools and the local train station. The busy and bustling East Sussex market town of Crowborough offers a wide range of amenities surrounded by stunning countryside and the town provides good shopping facilities. There is main line rail service at nearby Jarvis Brook with trains to London in approximately one hour. The town offers excellent recreational facilities including golf at Crowborough Beacon and Boars Head courses, Crowborough Tennis & Squash Club and the Crowborough Leisure Centre with indoor swimming pool. The property also gives very easy access to the famous Ashdown Forest with its superb walks and riding facilities. The spa town of Royal Tunbridge Wells with its more comprehensive facilities is about 8 miles distance, whilst the coast at both Brighton and Eastbourne can be reached well within one hour's drive. An open porch with an outside wall light leads to FRONT DOOR: Glass inserts and a large window to side. 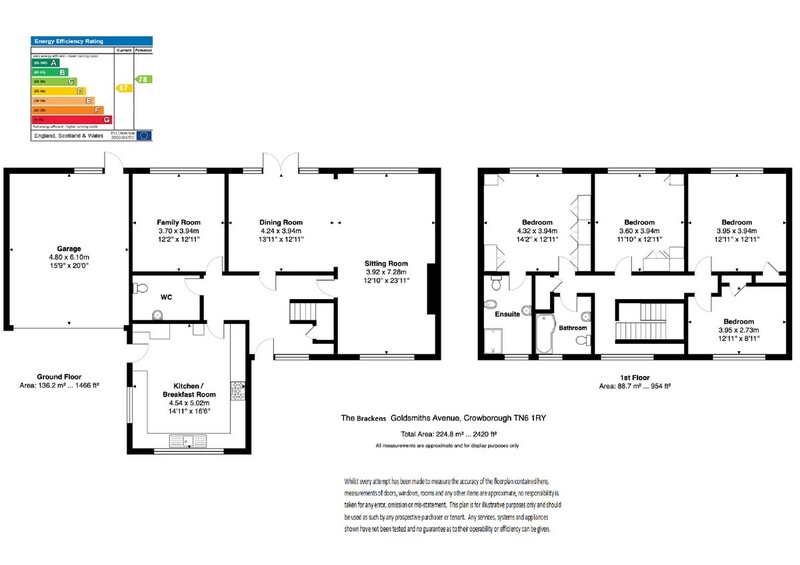 OPEN PLAN SITTING ROOM/DINING AREA: Sitting Room: A double aspect room with double glazed windows to the front and rear. Feature gas fireplace with stone surround. Two wall lights. Two radiators. Coving. Carpeted. Archway through to Dining Area: French doors with double glazed windows either side leading to rear garden. Two radiators. Coving. Carpeted. Wooden door with glass inserts leads back to the hallway. STUDY/FAMILY ROOM: Double glazed window overlooking rear garden. Radiator. Coving. Carpeted. DOWNSTAIRS CLOAKROOM: Wash hand basin inset into large vanity unit, low level WC. Part tiled. Coving. Recessed LED spotlights. Tiled floor. Wall mounted towel rail. Extractor fan. EN-SUITE SHOWER ROOM: Glass enclosed shower with modern shower head and hand held shower attachment, shower tray, low level WC, bidet, wash hand basin inset into vanity unit with mirror above, fitted shelving and spotlights. Fully tiled to walls and floor. Two wall mounted towel rails. Coving. Recessed LED spotlights. Double aspect with obscure double glazed windows to the front and side. BEDROOM: Double glazed windows overlooking the rear garden. Carpeted. Coving. Radiator. Sharp bedroom furniture including fitted wardrobes either side of bed recess. Fitted dressing table and large fitted open bookcase with shelving. BEDROOM: Double glazed window overlooking rear garden. Carpeted. Coving. Radiator. (Currently being used as an office/library). Built-in cupboard with hanging rail and shelving. BEDROOM: Double glazed window overlooking the front with lovely views over the North Downs. Carpeted. Coving. Radiator. Built-in cupboard with hanging rail and shelving. FAMILY BATHROOM: Fitted with a suite comprising of panelled bath with 'Mira' shower, low level WC, wash hand basin with mixer tap inset into large vanity unit with mirror above, cupboards aside and light over. Fully tiled to walls and floor. Shaver point. Coving. Recessed LED spotlights. Extractor fan. Wall mounted towel rail. Obscure double glazed window to front. OUTSIDE: The property is approached via a sweeping in/out brick paved driveway. The front garden is mainly laid to lawn with a range of mature shrubs and bushes and mature trees. To the left of the house there is a double garage which has a key fob operated up and over door, non slip flooring. Range of high and low level units with roll top work surface, ample shelving, gas meter and double glazed door with obscure glass leading out to the rear garden and double glazed window. Strip lighting. Outside water tap. To the right hand side of the property there is a wooden door which leads through to the rear garden. Electric power point. Large paved patio. Two wall lights. Steps lead to a large area of lawn. Range of mature trees and bushes along with a rockery, insulated summerhouse with valuted ceiling and cushioned flooring, French doors with picture windows either side and six double glazed windows in total. Two wooden sheds, greenhouse, raised flower beds and compost heap. The rear garden is approximately 0.75 of an acre (tbv) and is fence enclosed and enjoys wonderful views across the North Downs.